More than two years ago, I developed a technique for myself revolving around the idea of making vows. This technique can help you accomplish things you really don’t like to do, and can even get you to a point where you start enjoying them. By following the guidelines below, you’ll be able to gradually exclude ineffective and outright bad habits from your life, while integrating new, beneficial habits, increasing your productivity, making more money, and generally improving your life. Over the course of its use, I’ve observed a truly powerful effect from this technique, so I now apply it to my life all the time. I’ve also shared this technique with others and received nothing but positive feedback, which was, frankly, surprising, given how unpredictable many productivity-based techniques are due to the huge variety of personality types among people. Before diving into the technique itself, however, let’s look into the concept of vows. Wikipedia defines a vow as a solemn promise or assertion; specifically: one by which a person is bound to an act, service, or condition. If you look through more specific applications of vows throughout history, you’ll notice that they generally take on the form of swearing to perform some act, often to a deity or leader, and that a vow is often perceived as the kind of promise that absolutely cannot be broken under any circumstances. In this technique, the object of the vow will be your own self. You act as both the one performing the act and the one expecting nothing less than a positive outcome. The punishment for breaking your vow, in this case, becomes loss of your own dignity in your own eyes. Should you fail to live up to your word, you’ll simply lose all respect for yourself, forever, becoming nothing more than a “worthless sod”, or a “village idiot”, or whatever title you can think of to best describe the kind of state you want to avoid at any cost. So you have a problem you want to solve. Perhaps you’ve even tried to solve it before but failed. Or perhaps you’ve even convinced yourself that you’re just perfectly fine with the lack of a solution. Yet at the same time, you also understand that you can’t simply go on living in this way, that your life isn’t going in the direction you’d like it to go. You may have come to realize that this problem is outright destroying your life, making you and even those near you miserable. This type of problem isn’t uncommon and comes in a variety of forms unique to each individual. Let’s take three examples so that we have something concrete to tackle. You’ve found a way of making more money, one that’s entirely within your power to take up, and one that will make you considerably wealthier than you are now, but it requires a lot of consistent work. Unfortunately, laziness and lack of organization stop you from properly engaging with this new work. You’ve noticed that you’re drinking (or smoking) too much, doing so more often than even you think is reasonable. Unfortunately, the habit has been formed, and whether you admit it or not, you’re addicted, unable to stop. You’ve realized that you’ve become rather unbridled in your anger. You constantly let your rage and other extreme emotions out in unhealthy ways, damaging relationships with friends and family in the process, only to regret doing so later. Unfortunately, your lack of self-control doesn’t allow you to gain the upper hand over your emotions. Have a similar problem that you’ve come to detest? Then let’s formulate your first vow. And make absolutely certain to write it down. Personally, I use the Evernote app for this as well, but use whatever tool you like the most. Don’t attempt to destroy your current self once and for all. 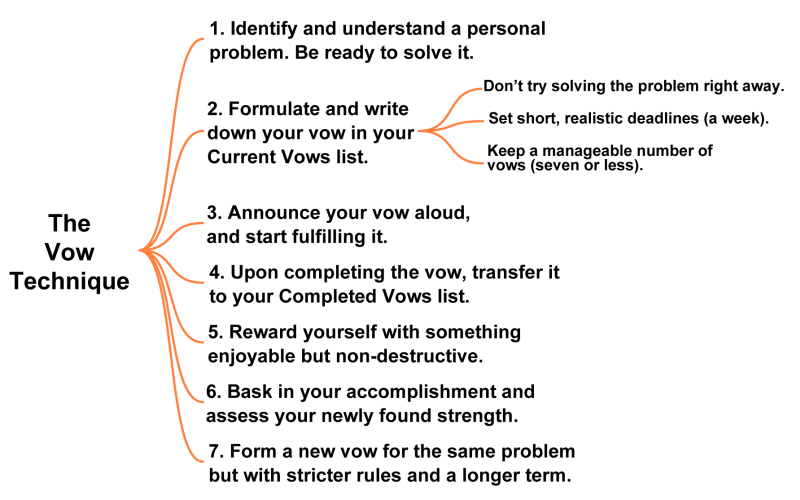 Start out with vows that have short-term deadlines, optimally about a week. Avoid forming more than half a dozen vows at any given time. This is similar to the Five Point Approach we talked about at the start of this book, so feel free to review it for additional guidance. With all that in mind, here’s what your vows would look like for the above three example problems. I will commit one hour every week to develop a new source of income. Throughout the week, I will actively say “no” to alcohol/smoking (e.g. avoid all alcohol on weekdays, or smoking no more than three cigarettes per day). 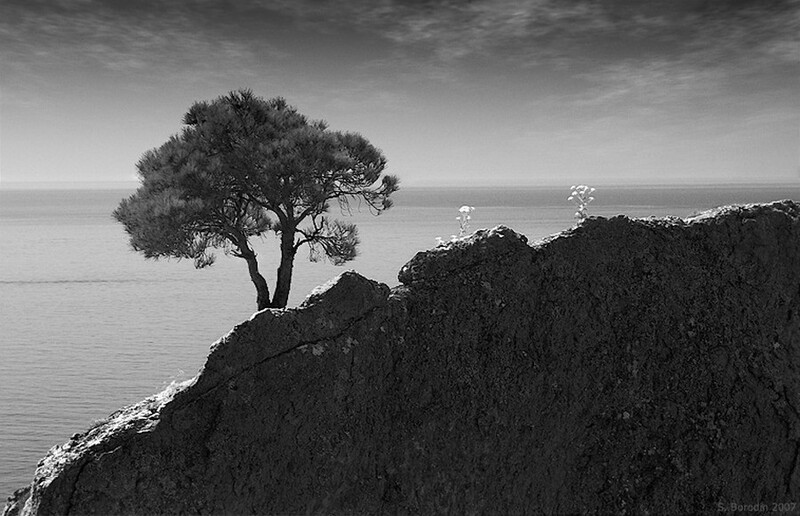 Throughout the week, I will pause before responding to someone and react in a measured way. Now write down your own vow, and it’s time to start executing it. Upon completing a vow, perform a celebratory transfer of it from your active list to your completed list. Going forward, looking through your list of vows will inspire you to greater heights. The important thing here is to truly immerse yourself in the feeling of accomplishment upon completing a vow. Do this, and you’ll feel an influx of strength and a lasting feeling of self-respect. Remember that feeling well. It will grow stronger with every new vow you complete. It’s this gradual building up of your own inner foundational structure that will lead you to success by making you your own hero. After completing a vow, reward yourself with something pleasant but measured, something that doesn’t act in a destructive manner against all that you’ve built up inside yourself. Upon accomplishing what you vowed to do, you can either rest for a while or form another vow right away, but the next vow should have a longer duration. Once you find yourself capable of accomplishing a 40-day vow, you’ll then be able to move forward to even lengthier vows, including ones that encompass a year, three years, or even five years of time. At a certain point, you may even feel the sheer inner strength to formulate an infinite vow that will last your entire lifetime. On top of all this, completing vows will make you notice other unexpected but pleasant changes in your life that won’t appear directly connected to your efforts in accomplishing your vows, and that too will help you grow stronger still. Here’s another simple chart to help you memorize this technique. That’s it for vows. Now let’s move on to another powerful technique that will help you transform your reality for the better. As mentioned previously, this technique involves affirmations.